How can Vitali-Chi Help You? If you are tired, stressed or anxious, overweight or have trouble sleeping, feel low or maybe feel stuck in your life and are not sure which direction to take, my Vitali-Chi treatments can help. They can either help you physically or emotionally and together we can work to improve all aspects of your life from diet to exercise and how you think, feel and react within relationships and life situations. 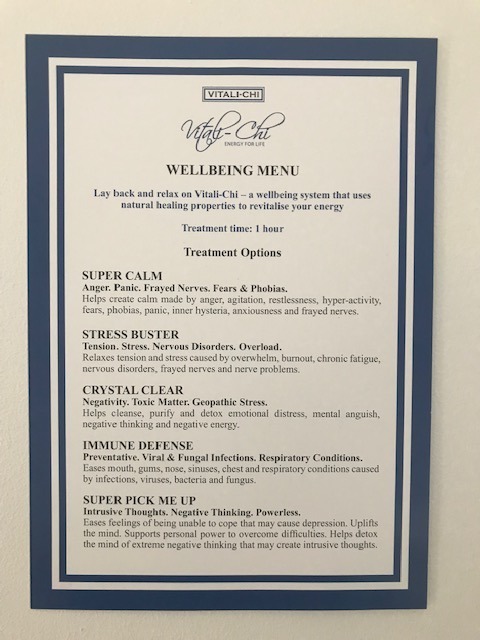 I can tailor your treatment to exactly what you want and need or you can simply choose a treatment from the wellbeing menu below. I can help you with relaxation or getting your energy back or if you suffer from specific physical or mental symptoms you may need deeper work. In my treatments I use Vitali-Chi, a passive, non-mechanical, preventative and effective health care circuit. Based on the ancient healing system of Acupuncture but without the use of needles, it uses the healing properties of copper to help re-align and rebalance the body’s own natural energy system. Vitali-Chi helps to clear the energy pathways of blockages so that your natural energy can flow in one continuous smooth circuit. It is this vital natural energy, that when flowing smoothly and freely can prevent and heal disease. The treatment can either be energising or relaxing since it works towards balance in whichever way the body needs. It is very simple and very effective, all you need to do is lay down and relax! Vitali-Chi delivers natural healing properties called frequencies to assist healing the root cause of ill health. When used with Vitali-Chi they go straight to the energy field where the disturbed energy is held and to the channels of energy where there may be blockages. It is thought that this is where disease starts to manifest. The natural healing properties are gathered from the natural world of flowers, herbs and essential oils and earth minerals. All of which help to revitalise the natural energy flow throughout your body. Everything in nature vibrates at a different frequency. Quantum physics describes the universe and us within in it as nothing more than vibrating energy. When parts of the body become stressed or dis-eased, they are no longer producing the correct vibration, in other words they are not vibrating at their optimal frequency. To re-establish or recalibrate your frequency, you need to understand how lower and higher vibrations affect your energy and health. All life vibrates and everything living moves. All colours and sounds vibrate to a frequency, nothing sits still. The cells in our bodies need to be vibrating at a high level for optimum health and when the frequency drops, our immune systems are compromised making it very difficult for our bodies to heal and recover. This is when we can become poorly. According to Dr. Royal Rife, a scientist who discovered the healing power of frequencies in the 1930s, every disease has a frequency. He found that certain frequencies can prevent the development of disease and that others would destroy disease. Substances with a higher frequency will destroy diseases of a lower frequency. The study of frequencies raises an important question, concerning the frequencies of substances we eat, breathe and absorb and how we live our lives. Humans vibrate fairly low compared to plants, herbs and flowers. Sick humans vibrate much lower on the scale. The highest vibrational substances are contained in herbs and flowers. Vitali-Chi delivers blends of these higher substances called frequencies to help you return to a higher and healthier vibration. Just over two years ago I had a baby born prematurely. Immediately after I seemed to take it all in my stride but the affects of going through a stressful time started to show. I delt with it for some time however I got to the point I couldn’t stop thinking negative thoughts mainly about my son and others I love, and their health. With anxiety, low mood and self confidence getting lower I contacted Sarah and started V Chi treatment. To say its worked is an understatement, from the first treatment I felt like i’d been re-programmed. Its the most relaxing feeling connected to the copper circuit and Sarah provides excellent life coaching skills to work alongside this. I can honestly say to anyone thinking about having the treatment, its well worth the time and money. I think it maybe a life long treatment for me now. I started using Vitali-Chi after feeling really tired all the time, craving sugary foods and always catching coughs and colds. I felt generally run down and working plus looking after my two year old son was becoming extremely difficult. I had no patience and felt irritable most of the time and decided to look for some help. A friend recommended Sarah to me so I booked an initial consultation and decided to try a session. Sarah made me feel very relaxed and we discussed my lifestyle from diet to sleep, my worries, everything. The hour I spent laying and relaxing on the copper health circuit was amazing ! I fell into a wonderful sleep and afterwards felt so much better, it felt like the best power nap ever. Since then I have changed my eating habits, make sure im in bed earlier and along with a tonic that Sarah provided me with from the V-CHI product range I feel so much better. I now go and have a regular session when I feel I need it. I highly recommend Vitali-Chi with Sarah, it has really made a massive difference to my overall health and wellbeing. Please call or email Sarah for more information and a free no obligation initial consultation. This method of healing is not to be used in place of or postponement of traditional medical treatment, so if in doubt please see your doctor.